Issue: At the balcony, water was entering the TV den, warping and cupping the hickory/pecan floor. Also, water was coming out of drywall around two windows in the studio below the balcony. The builder took no action to solve the balcony problems. 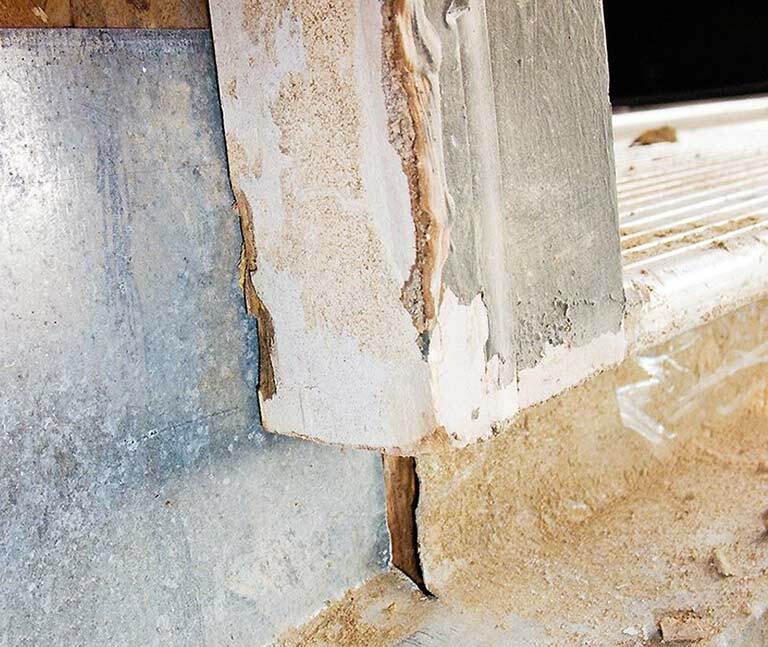 allowed two large holes in the metal flashing, one on each side of the door to the TV den, where water had been coming onto the hickory/pecan floor. 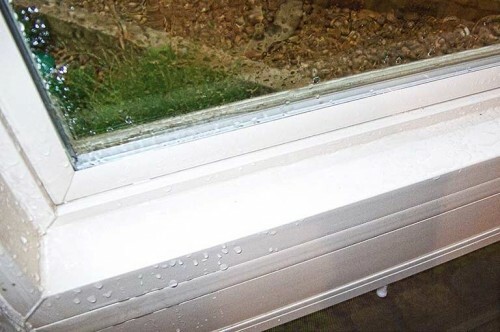 Q: Did you have an opportunity to inspect that balcony at the time of its construction to ensure that it was adequately flashed so as to prevent water penetrating the inside of the house? Q: You did inspect it? Q: And it met your approval? 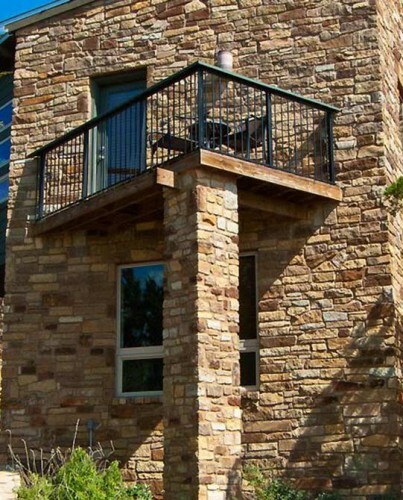 Rutherford Custom Homes-built balcony became interior waterfall. Windows, installed without weather seal, leaked during construction. Water from balcony warped, cupped wood floor. 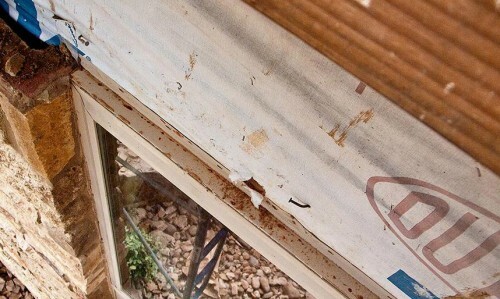 For more than a month, builder took no action to fix balcony. Rain entered these south studio windows, as it did during building process. 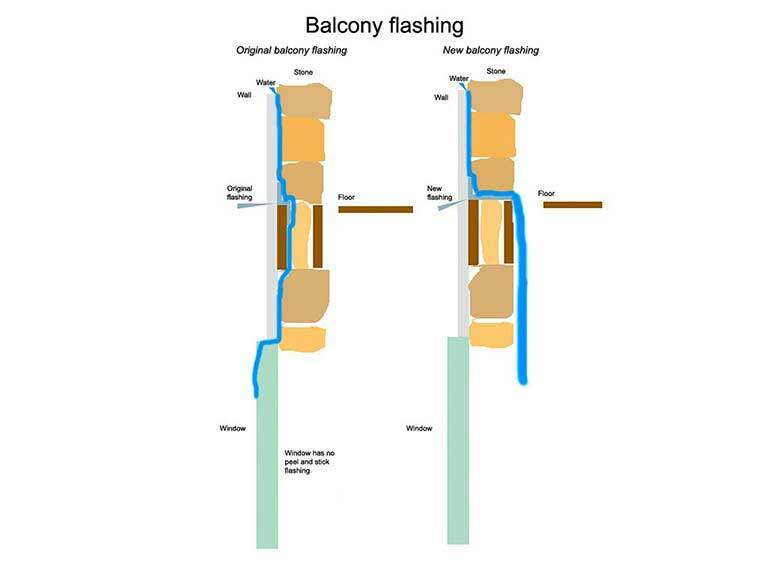 Both under-balcony windows had heavy leaks. It rained on windows both outside and inside. 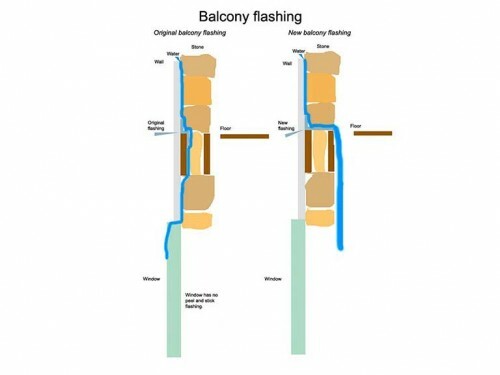 Owner-hired floor expert checked moisture inside balcony wall. Red line. Rutherford Custom Homes' balcony construction enabled water intrusion. 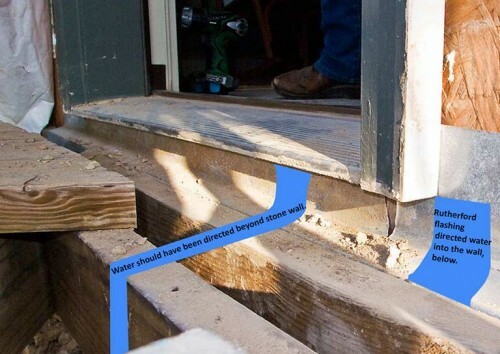 When drought ended, Rutherford Custom Home problems escalated. Balcony floor was built high. Stone wall had to be removed to stop new Rutherford Custom Home in Wimberley, TX, from leaking like a sieve. Removal of stone revealed Rutherford Custom Homes' damaging building issues. Balcony door was not sealed. 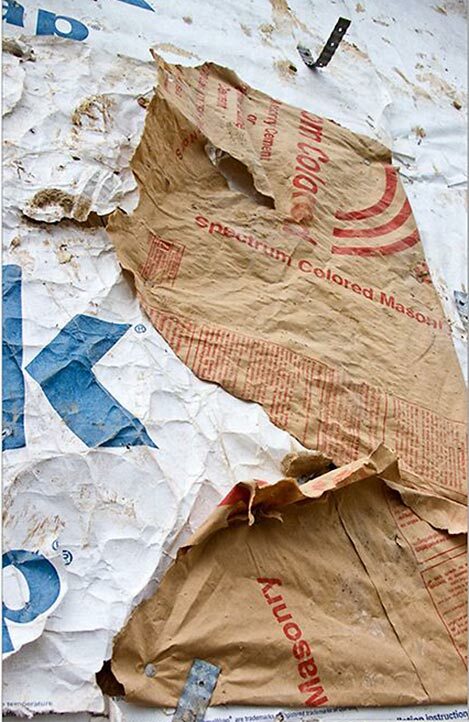 Removed stone exposed paper bag used as moisture barrier. Large holes enabled water entry through flashing. 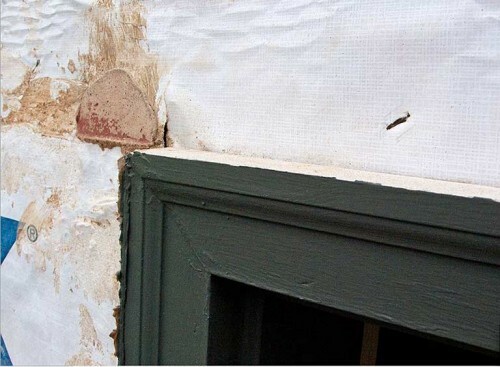 Large flashing holes enabled water entry into home. 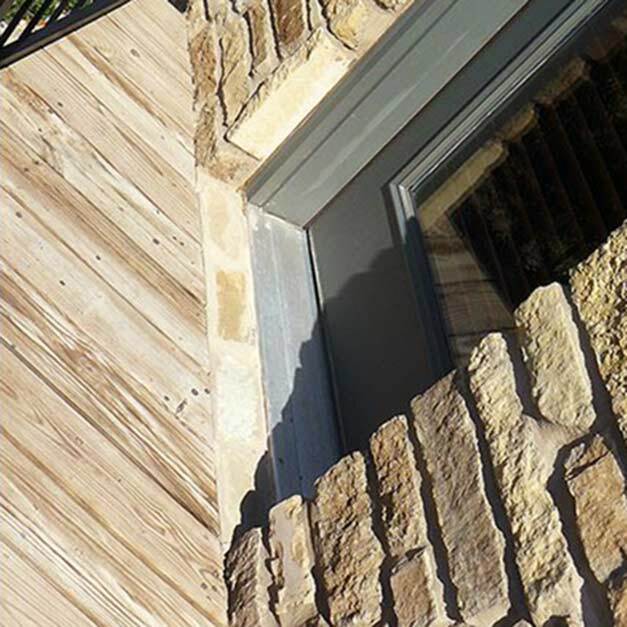 Rutherford Custom Homes' flashing enabled water to enter the home in multiple ways. Construction directed water both over and behind Tyvek Wrap from balcony. 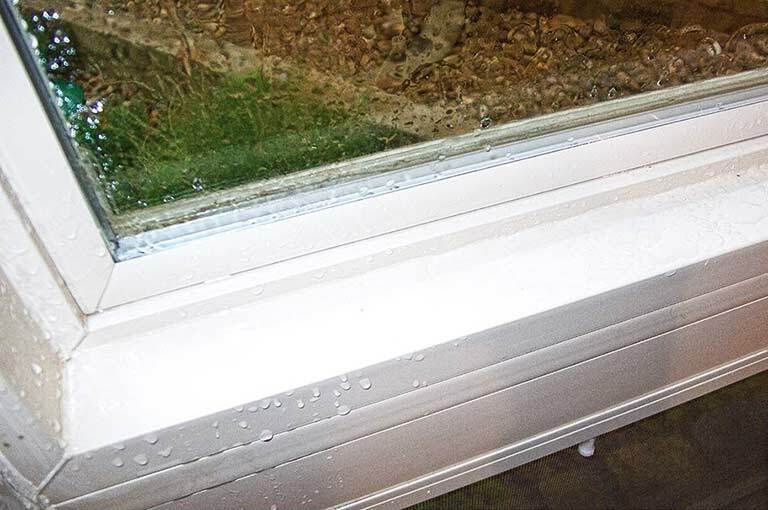 Water flowed from balcony to unflashed windows (no peel and stick), then inside. 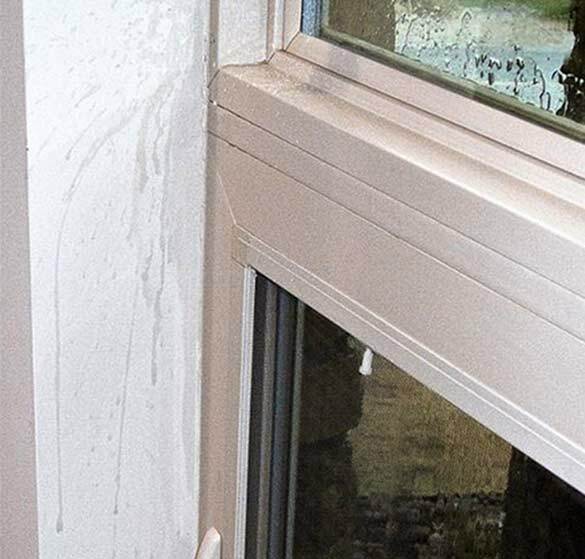 Rutherford Custom Homes did not weather-seal the windows. 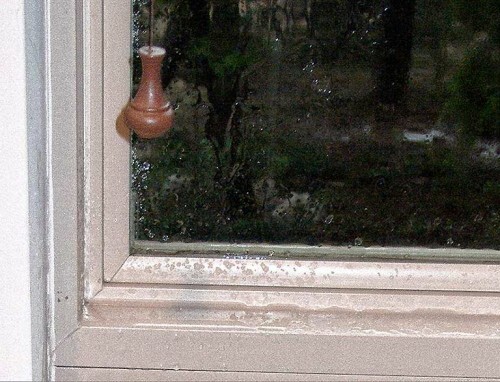 Beau Rutherford testified under oath windows were weather-tight. When we walked onto the just-hardened concrete foundation at the start of construction, we had a view to the south and asked if we could add a small balcony. Yes, we were told. The architect got plans to the builder quickly, during framing. The balcony as built, however, directed water into the TV den’s hickory/pecan floor, destroying it, and into the wall and studio below, coming through drywall around the unflashed windows. During construction, we pointed out by phone to Jim Rutherford that water was on the studio floor and appeared to be coming out of the wall from the windows under the balcony. We added it to the 9/22/08 To Do list, which was still during construction. Rutherford Custom Homes either took no action or took ineffectual action to fix the water intrusion. 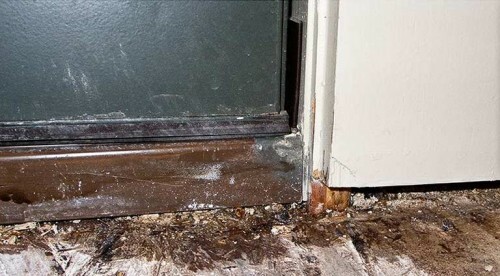 The floor, however, was cleaned up after the leak. 6/4/09 – On “To Do” list, tv den door to balcony would not open, blocked by the greatly warped wood threshold. 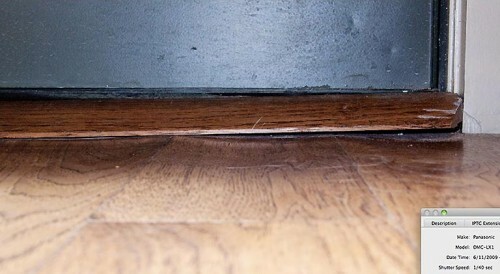 The hickory/pecan floor below the threshold was cupped. 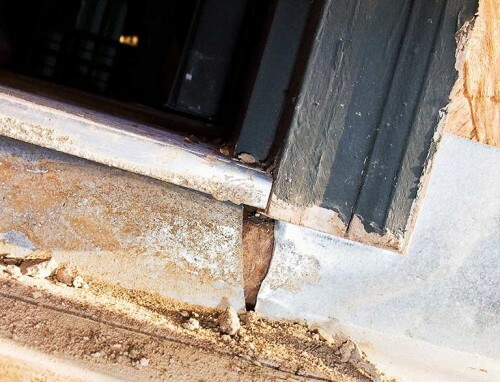 Rutherfords said they’d sand down the bottom of the threshold board and that would fix the problem. They did not address the cupped floor. 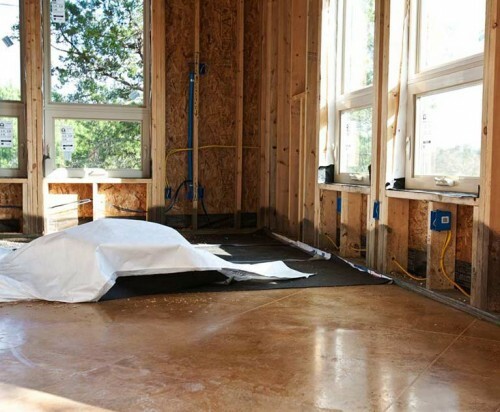 Wanting an opinion on the cause of the problem, we called out the flooring store. 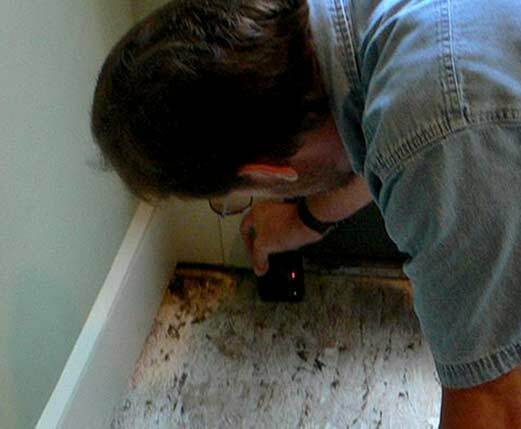 6/25/09 – The floor representative’s moisture meter showed very heavy water in the TV den floor inside the balcony, but also in the living/dining room. And a deeper-reading meter showed heavy moisture in the subfloor. 6/25/09 – We again showed Beau and Jim Rutherford the problem areas and shared the major water intrusion information. 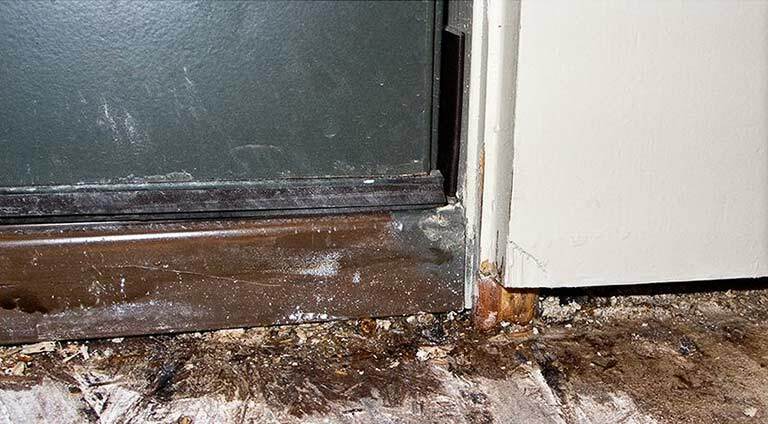 Beau Rutherford attributed the water damage to door seals and tightened the living room and balcony doors but offered nothing to fix the TV den floor beyond sanding down the balcony threshold. 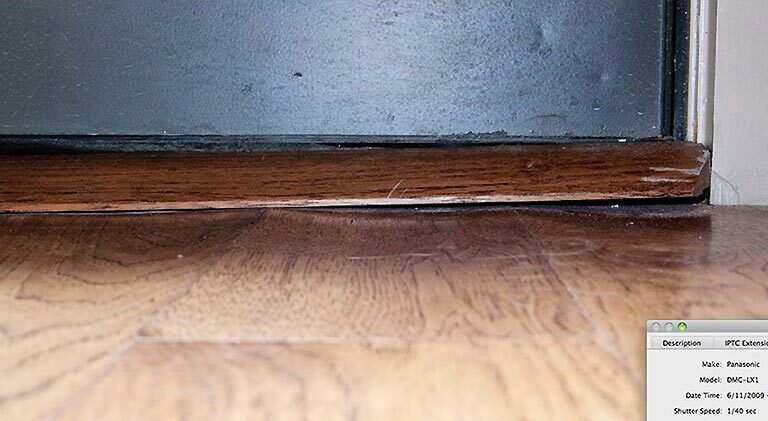 6/4/09 – 7/16/09 — Rutherford Custom Homes’ did nothing about our widespread wood floor problem or the problem with the balcony. They’d already sent someone twice to check 15 leaking windows but they were not fixed (they sent not the windows framer, but a person who didn’t know that behind stone and Hardiplank, the windows were not flashed), someone to fix the roof (still leaking), painters to correct problems (they never finished the job), and now the balcony and wood floor had problems. Our problems were spreading and getting larger. We could not reach Rutherford Custom Homes as no one was answering the office phone. We tried their cell phones, then their home phone. We also tried email but never got a response. 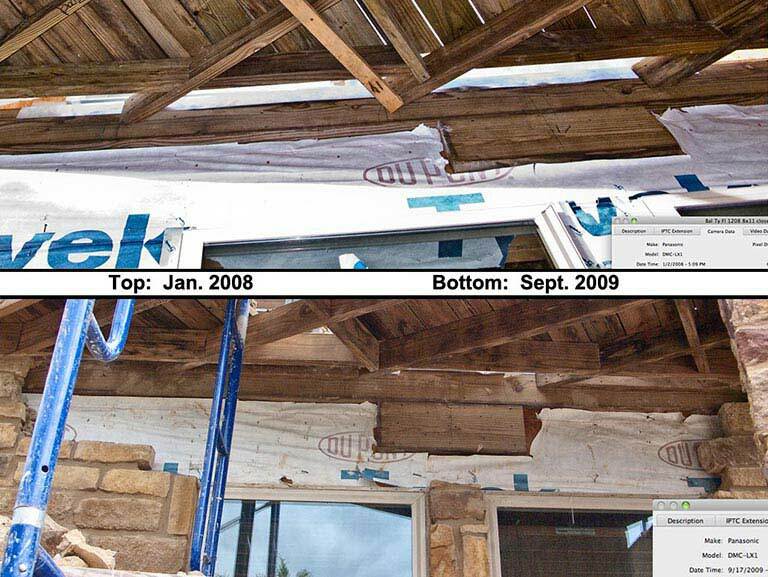 We terminated Rutherford Custom Homes in late July, 2009. Sept. 17-20, 2009 – Two months after terminating the builder and trying to find what the TV den water and studio below water had in common, we decided to check the balcony. 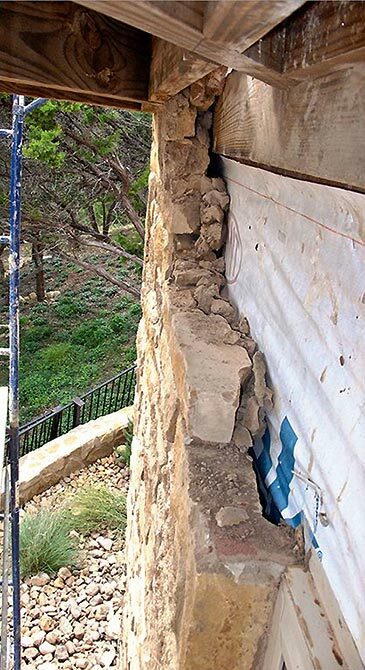 Tons of stone wall were removed above and below the balcony, revealing critical balcony defects that directed water into studio wall and TV den, where it destroyed a portion of the hickory/pecan floor. 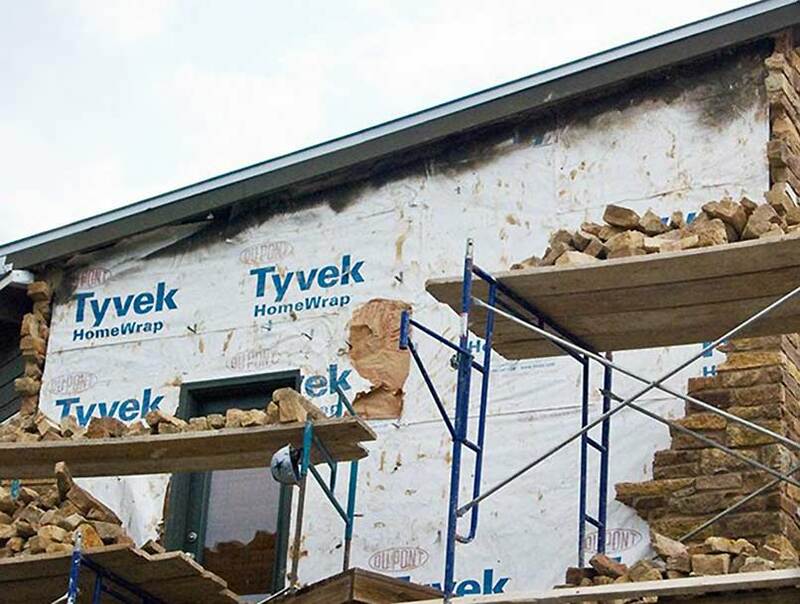 Q: With respect to the application of the Tyvek to the exterior of the house, do you recall inspecting the application of the Tyvek prior to it being covered with stone or wood? Q: And did it pass your inspection? 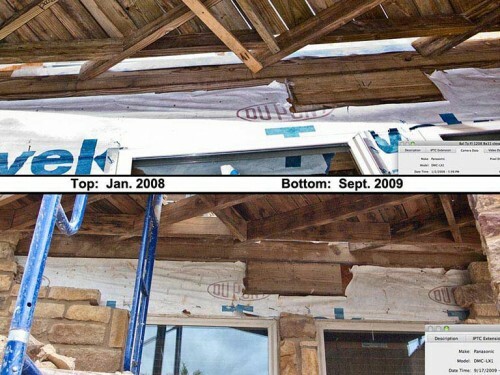 Q: And was it properly taped around the windows and doors and every place to your satisfaction?